Post subject: First Maps of Pluto and Charon! This is a Single, Endless Day on Pluto. A full day on Pluto is approximately 153 hours long (6.39 Earth-days), so the gap between each image captures 15 hours and 20 minutes of rotation. These latest images are spectacular. In other news, Pluto's blue haze is not from water but tholins in the atmosphere. The water ice is on Pluto's surface, as far as New Horizon's data suggests. If water were in Pluto's atmosphere, it'd freeze and precipitate out rather than linger in the skies. Charon's outer layer is mostly water ice. When the planet was younger, the water was probably kept liquid by heat from radioactive elements and Charon itself, as it formed. If Charon was warm enough to cause water to melt below the surface, it may have created an ocean. But as the space rock cooled, the ocean would freeze — and expand. That would account for the chasms observed by the orbiter, some of which are more than 4 miles (6.5 kilometers) deep. That's four times the depth of the Grand Canyon. Of interest is what appears to be a small plume in Pluto's northern hemisphere near its polar region. Look to the upper right of Pluto's limb. It shows up a few frames before Tombaugh Terra rolls into view. Make your own Pluto globe! The feature is made of six fractures that span out from a central point like spider legs. The longest one is named Sleipnir Fossa, and it's about 360 miles long. You can see a red subsurface layer exposed by the cracks. 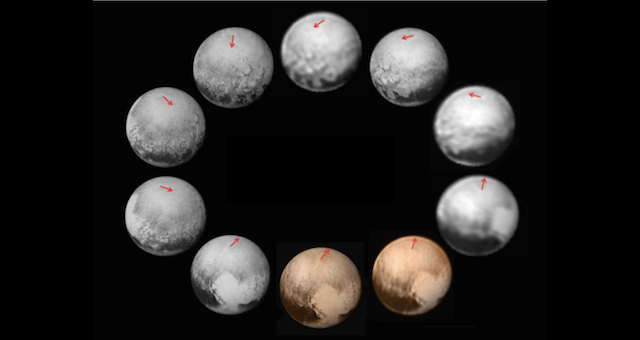 Mysterious "haloes" spotted on Pluto! Love this article so much. He makes another very good point. Stern says that if Earth was located in Pluto’s position in the solar system it also wouldn’t qualify as a planet. “It’s ridiculous,” he says. He even claims that, according to the maths, Brown’s Planet Nine would not quality for planetary status, “no matter how massive it is”. Science should be about the love of knowledge, discovery, and contributing to society. It should not be about fame, recognition, settling a score, the meaning of a word, an emotional attachment to an idea, or making money. To me, Albert Einstein came closest to being the ideal scientist. He know what science was all about. I wish all scientists would follow his example. Images captured by New Horizons’ array picked up the spectral fingerprints of unusually clean ice all over Hydra. By itself, that news is not surprising, as New Horizons has revealed that the Plutonian system is quite abundant in water ice. But for some reason, Hydra has some next-level snow purity on its slopes, which results in a much brighter surface than other moons, like Charon. Pluto is a hybrid dwarf planet-comet-planet… thing, and no one’s quite sure what to make of it. "This is an intermediate interaction, a completely new type. It's not comet-like, and it's not planet-like. It's in-between," says McComas. "We've now visited all nine of the classical planets and examined all their solar wind interactions, and we've never seen anything like this." 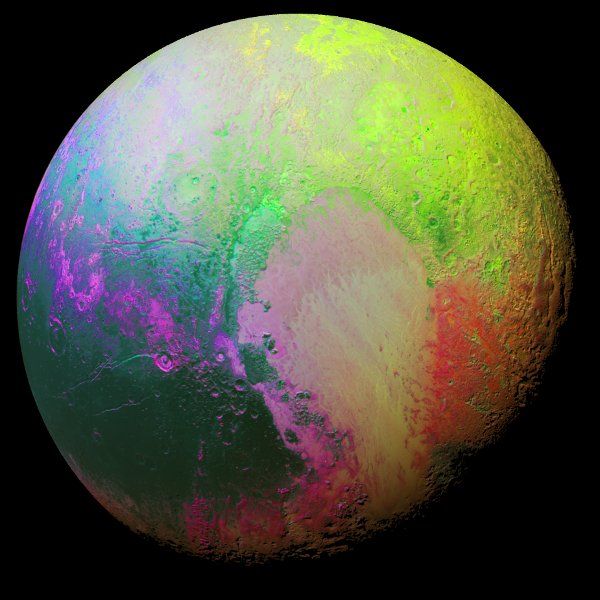 What percent of Pluto's surface were they able to get detailed images of? Would they have enough information to make a globe or would they need to do a flyby of the other hemisphere? They only imaged one hemisphere since this was a flyby. New Horizons was going so fast that it wasn't feasible for the probe to enter Pluto's orbit. Its closest approach was 10 miles over the surface. From the video one can see the area with high detail was particularly small. There was an animated gif showing the view of New Horizon's approach to Pluto but I'm unable to find it. From that I would gather one could create a fuzzy image of the other side of Pluto. 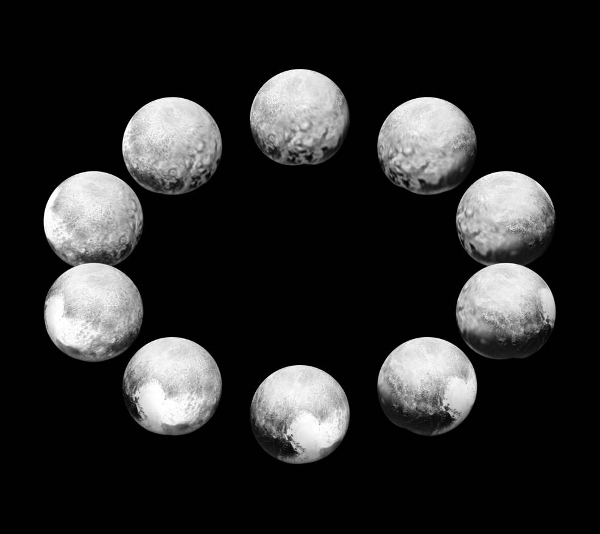 If you're feeling crafty, you can create your own Pluto globe. Yet another "build-your-own" project for Pluto. Obviously, Pluto doesn’t actually have a heart that pumps blood like ours do because, you know, it’s an icy dwarf planet. But according to two new studies – one by researchers from Washington University and another from a separate team at Purdue University – Pluto’s heart 'beats' when warm nitrogen ice rises upwards, spreads along the surface, and freezes over Sputnik Planum.